Picture above you will see one of our most recent installs in Chandler, AZ. This full arch Iron entry door is just stunning and completely transforms this entryway making it almost unrecognizable. 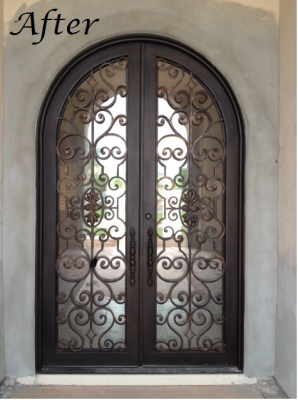 In addition to the unique design this iron door offers a stronger sense of security while allowing more natural light to enter the foyer. Living in Chandler, AZ, as a resident you endure months of extreme heat. Not to worry, all of our Iron doors are fully insulated units allowing light to enter your home with little heat. 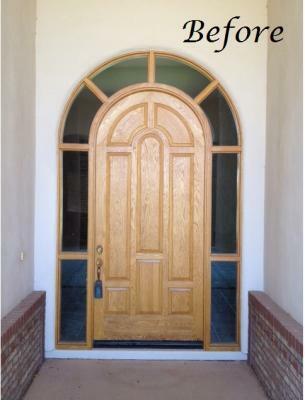 Signature Iron Doors is located in Phoenix, AZ and we invite you to explore our website and contact us to schedule a consultation with one of our representatives and allow us to help you discover the true potential your home holds. Whether you are looking for an Iron entry door, perhaps some iron railing or even one of our unique to the market iron garage doors, Signature Iron doors is here for you and all of your iron needs.